Andrea Mitchell knows how to get the story. She’s been reporting for NBC News on foreign affairs, national security and political issues that have defined the nation since 1978 — more than four decades — and shows no signs of slowing down. 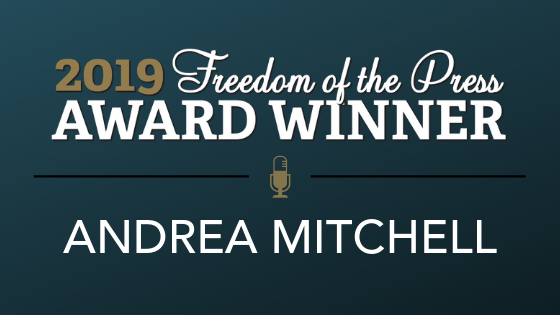 In May, the Reporters Committee for Freedom of the Press will honor Mitchell with a 2019 Freedom of the Press Award in recognition of her extensive journalism career and work advocating for the First Amendment rights of journalists, part of which has included serving on the organization’s steering committee for more than a decade. David Cohen, Comcast-NBCUniversal senior executive vice president and chief diversity officer, said Mitchell sets the standard for journalism. Mitchell, who has also been an energy correspondent, chief congressional correspondent and chief White House correspondent at NBC News, has covered seven presidential administrations and filed exclusive reports from North Korea, Afghanistan, the Middle East, Bosnia, Kosovo, Pakistan and Haiti. She has been at the forefront of covering a range of news of historical significance, such as multiple congressional races and presidential campaigns, U.S.-Cuba relations, the United Nations debate leading up to the Iraq war, the confirmation hearings for Supreme Court Justice Clarence Thomas, the Iran-contra scandal and the Three Mile Island nuclear incident, among others. Savannah Guthrie, co-anchor of NBC’s TODAY, said Mitchell’s work represents press freedom to the fullest extent. 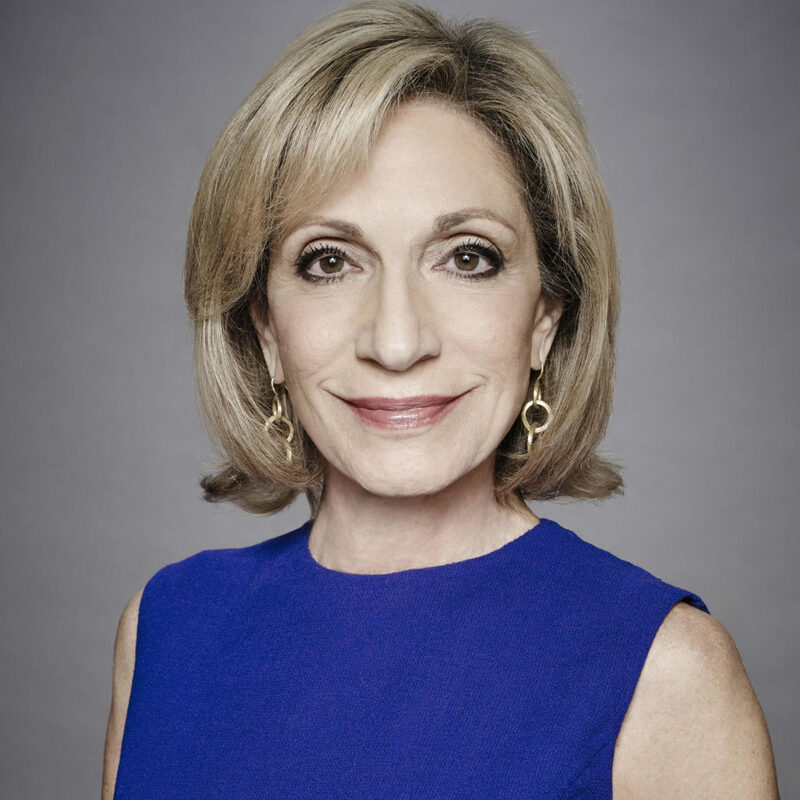 Mitchell continues to report on foreign affairs and anchors her own show on MSNBC, “Andrea Mitchell Reports.” In 2017, she established The Andrea Mitchell Center for the Study of Democracy at her alma mater, the University of Pennsylvania, which offers research grants, fellowships and workshops to promote and understand democracy. She graduated from Penn with a degree in English literature in 1967 before working as a broadcast journalist in Philadelphia until 1976. A few years later, Mitchell joined NBC as a general correspondent and is now the network’s chief foreign affairs correspondent. “She got to the top of her field by being determined, prepared, the best, and by always fighting for what she believes in,” NBC News White House Correspondent Kristen Welker said. Welker, who’s known Mitchell for years, said the longtime reporter is an inspiration to female journalists everywhere. Woodruff, who is also on the Reporters Committee’s board, was a former NBC News White House Correspondent. She worked alongside Mitchell during this time, and credits Mitchell’s success to her tenaciousness. The example Mitchell sets is especially important at a time when journalism is evolving. The Reporters Committee will also present 2019 Freedom of the Press Awards to April Ryan, White House correspondent and Washington bureau chief for American Urban Radio Networks and CNN political analyst; John Carreyrou, investigative reporter for The Wall Street Journal; and David G. Bradley, chairman of Atlantic Media. The founders of City Bureau — Harry Backlund, Bettina Chang, Andrea Hart and Darryl Holliday — will also be recognized with the Reporters Committee’s second annual Rising Star Award.